at the party (next to the bride, of course)! at our Oakville boutique or shop online now! Baptism Outfits for boys and girls. gowns and suits - at the best prices. Contact us and visit our Oakville showroom or shop online! ring bearer duties, or any formal party occasion. Complete boys formal wear means we have boys dress shoes in store and online, too! Contact us to visit our Oakville showroom or shop online now! beautiful girl shine on this sacred occasion. Complete the outfit with girls dress shoes! Shop online or call for an appointment! 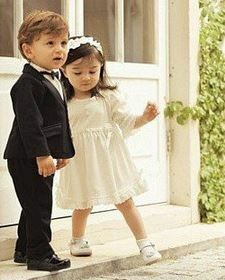 Shopping for children’s formal wear means shopping with us! Across Canada, parents have found the best little boutique founded in Oakville, Ontario 33 years ago. Times change and we now provide a showroom where you can see featured baptism outfits, Christening Outfits, Baptism Gowns, Christening dresses, Holy First Communion dresses, Girls First Communion gowns, girls holiday dresses, and flower girl dresses. Find great boys formal clothes , boys vest sets and boys suits all at affordable prices! Our online store offers an expanded selection of kids formal wear, dress shoes and accessories plus party favours. Shop for boys and girls formal wear clothing for all special occasions including Baptisms, First Holy Communion and Weddings online now! Whether you’re local in the Oakville, Burlington, Toronto, Ottawa, Montreal, Brampton, Hamilton, St. Catharines, Grimsby, Brantford, Niagara Falls, Milton, Kitchener, Guelph, Cambridge, Dundas, Mississauga or outside of Ontario – now all Canadians can shop with us online all across Canada you can view our favorite children’s formal wear hand picked by our design team and ready for your little darling. Saturday 10am-3:30pm | Sunday Closed Happy Easter. Flower girl dresses in gorgeous designs are here! Find the perfect dress for your flower girl and all the little girly-girls in your wedding party. Accessorize to your hearts content with veils or hats, gloves and more! Also see our collection of girls party dresses and oh-so-cute dresses for babies and toddlers. Also, find Holy First Communion dresses and girls First Communion gowns that are high end, yet easy on the wallet. For your child’s or God child’s Baptism, trust us for quality Christening gowns and Baptism gowns for boys and girls at the best value. Whether its a traditional girls white baptism dress , short white Christening dress, long Christening dress, boys Christening romper or a sharp boys baptism suit with bow tie, we’ve a great selection for you! For all your christening and baptismal needs, shop our store today! Boy’s suits , tuxedos and vest sets in great styles are affordably priced! Dress up your little man whether for First Holy Communion, his duties as a ring bearer or junior usher, or for any formal event. He’ll look great from head to toe when outfitted with a great pair of our boys dress shoes, too! Make sure your boy is “picture perfect” shop at Grandma’s Little Darlings for a large selection of boys formal clothing.